He died, along with 11 other crew members, while serving on HM Trawler “Fraser” when it was sunk by a German mine off Boulogne, France. Owen John was born in Penmynydd, Anglesey in 1894 and the son of Joseph & Mary Williams. Both Joseph and Mary were born in Anglesey and married in 1893 and by the 1901 census were living in Woodbine Cottage, Prestatyn. Owen was the eldest child aged 6, William Robert aged 3, and Thomas Henry aged 1. The 1911 census found them residing at Plastirion, Gronant Road, Prestatyn. Joseph and Mary had a total of five children but two had died. Joseph was a self employed builder and contractor and Owen was employed as a joiner, probably by his father. The “Fraser” was built in 1907 by Cook, Welton & Gemmell Ltd Ship Builders at Beverley, Yorkshire. The 310 ton trawler Fraser, prior to being requisitioned for war service, was part of the Fleetwood, Lancashire fishing fleet with the port number H951. She was lost on 17 June 1917, after hitting an enemy laid mine off the French coast near the port of Boulogne. 12 of its crew lost their lives and were remembered on the local civic war memorial placed inside the Holy Trinity Church, Devon in November 1918 by the families of the fallen men of the Dover Patrol (Trawlers & Minesweeping Patrol). In 1945 the church was sadly demolished after enemy bomb damage. The memorial needed a new home. The Dover Sea Cadets (Training Ship Lynx) at Archcliffe Fort agreed to look after it at their headquarters. The Sea Cadets moved from Archcliffe Fort in the 1970’s and the memorial was given to Dover District Council for safekeeping. The memorial is presently held in safekeeping by the Dover Museum. In 2006 it was being stored in an obscure shed at Deal. It is hoped that the memorial will be placed on public display at some stage in the future. 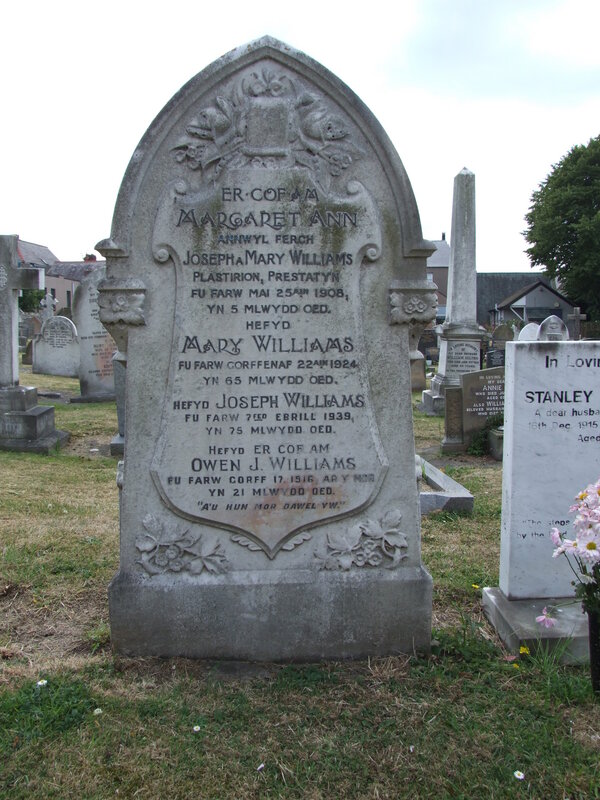 Owen’s mother died in 1924 and his father in 1939 and were buried in Prestatyn Churchyard. Owen is remembered on their headstone.